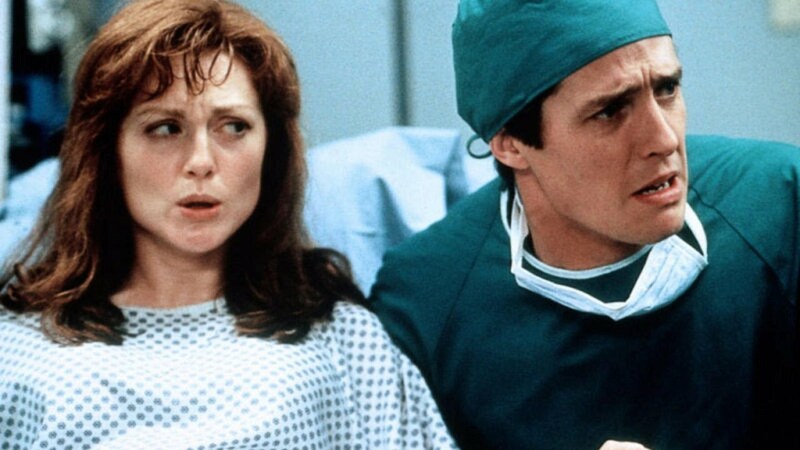 A romantic comedy about transitioning from couplehood to parenthood, Nine Months showcases Hugh Grant's emerging talents and achieves big laughs with some slick slap stick. 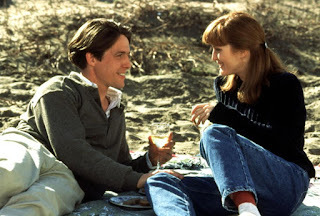 In San Francisco, child psychologist Sam (Grant) and ballet teacher Becky (Julianne Moore) are in a seemingly perfect long-term relationship. When she announces an unexpected pregnancy, Sam is frazzled and feels unready. His attitude is not helped by constant accidental interactions with the chaotic family of Marty and Gail (Tom Arnold and Joan Cusack), who have three kids and a fourth on the way. Sam's friend Sean (Jeff Goldblum), a struggling yet sophisticated artist, is also not a fan of babyhood, having just broken off a relationship to avoid becoming a father. As the pregnancy progresses, Becky becomes more committed to the idea of having a child, while all Sam can focus on is the loss of his independence and the fundamental changes to their lifestyle. The couple reach a crisis point, not helped by the seemingly incompetent efforts of Dr. Kosevich (Robin Williams), a recent Russian immigrant with limited vocabulary. Directed and co-written by Chris Columbus, Nine Months was Hugh Grant's first studio-backed Hollywood production. The film is perhaps overstuffed with Grant's signature mannerisms of rapid blinking, eye-shifting, stuttering and off-handed cynicisms, but overall this is a comedy that benefits from his talent and establishes the Grant screen persona as the likable but boyish urbane man who refuses to grow up. This is rom-com where the romance eventually takes a back seat to the comedy. Columbus firmly sets his focus on achieving crowning laugh-out-loud moments, and largely delivers. Some of it is pure slapstick, including an encounter with a Barney-type dinosaur at a toy store, but it works. And thanks to Robin Williams committing to the insanity of a veterinarian insecure about his first foray into human medicine, the film's finale is a frantic classic. In its more serious moments Nine Months preys on the theme of men unwilling to mature. Sam is at the peak of his youth's fantasy, enjoying being in love, an emerging career, a new sports car and a beautiful woman by his side. The concept of abandoning what appears to be perfection to dive into the world of fatherhood is terrifying, and not made any easier by his superficial observations of what appears to be the anarchy of families in the full swing of parenting. His transformation is of course linear and predictable, but Columbus makes the most of a natural and widespread anxiety. The cast members provide strong support. Moore registers as a woman fully embracing impending motherhood and unafraid to make difficult decisions when needed. Robin Williams has just the two prominent scenes but is unforgettable as Dr. Kosevich, while Jeff Goldblum delivers another version of his superficially smooth expert roles, gradually revealing Sean as a king of nothing. Nine Months captures the emotional disarray of pregnancy: the gestation period is long, if for no other reason than to allow men to catch up with the drastic changes to come.